HPDE is an abreviation for High Density PolyEthylene. King KPC high-density polyethylene is produced with a proprietary K-Stran™ process for unsurpassed flatness and quality up to 1-1/2” in thickness. For larger gauges our state-of-the-art compression molding system is utilized to create the same quality sheets, slabs and massive shapes. King KPC HDPE natural is FDA, USDA and FPA approved material that can be used for food containers and food equipment. * It is extremely versatile with outstanding properties and good chemical resistance for a wide variety of applications at a very competitive cost. King KPC HDPE has a low coefficient of friction and can be easily cut, colored, machined, welded, and thermoformed for easy fabrication. It may be used for some structural fabrication because of its superior tensile strength. It is moisture resistant, impact resistant and has great abrasion resistance. The material will not splinter or rot; resists stain and odor causing bacteria; and is very resistant to cleaning agents. For best cleaning results refer to Chemical Resistance Chart. King KPC HDPE is upgradable with King FlameShield, for ASTM E-84 Class A or B Flame/Smoke Compliance and CAN/ULC-S102 for Canadian Compliance. 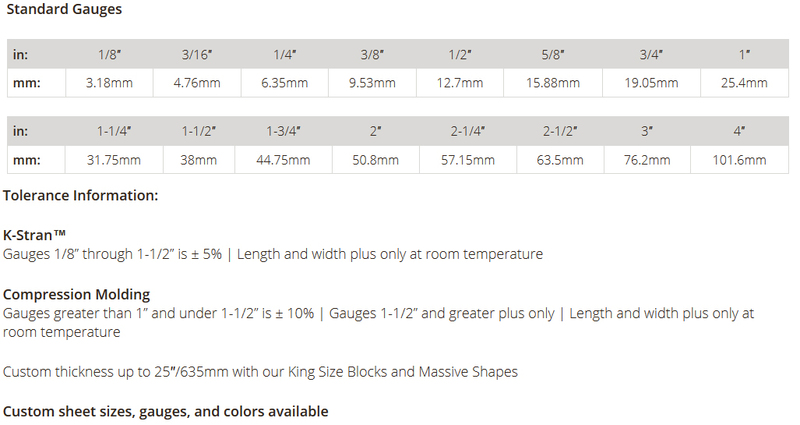 Standard Sheet size is 48″ x 96″.